A painter and gardening enthusiast, Kate lives in Alna, Maine. Her work is inspired by nature, architecture, and sometimes just by color. She grew up in Connecticut but finds Maine to be a great setting for living a mellow, creative life. Kate is best known for her iconic paintings of historic and interesting buildings, but her latest collection is a dramatic departure. According to the artist, she's allowing her creative vision to flow wherever it chooses: abstracted landscapes, boldly colorful images, and fantastical interpretations of the built and natural environment around her. Kate welcomes commissions for house portraits. Please contact the artist directly to inquire. 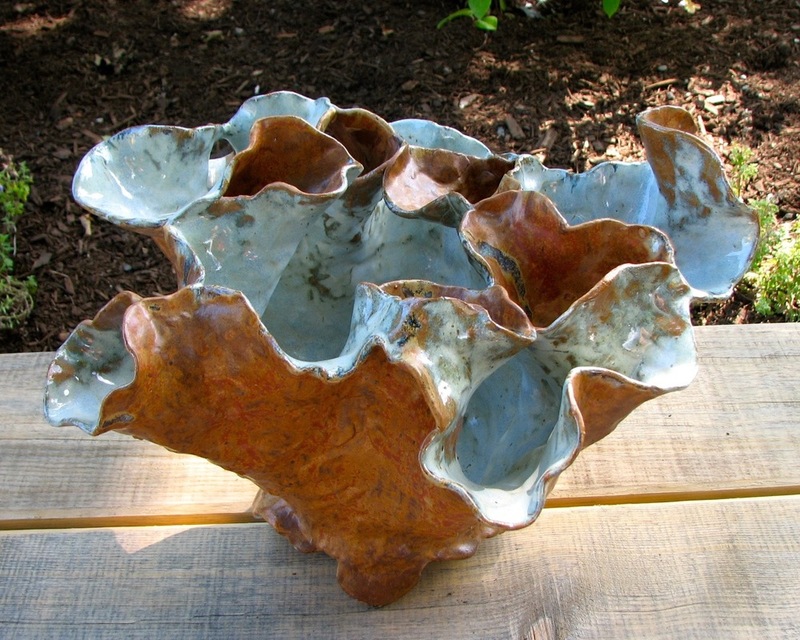 John uses a high fire stoneware body with a variety of hand-building techniques to achieve tactile and sensual effects: coiling, slab, press mold, pinching, carving, scraping. His larger pieces are meant to nest in a garden setting while the smaller pieces can be brought into the home to evoke the outdoors. John's vases, pedestals, birdbaths, and garden sculptures are on display at Carriage House Gardens. Each piece is hand-built and one-of-a-kind. "The time I spend in gardens is as important to me as the time I spend in the studio. I look for ways to integrate my ceramic work into the garden setting to enliven a space, either by creating dynamic interactions or quiet moments." URN with double rim, 15 1/4"h, $225. Porcelain urn in iron stand, $150. Our sensory and emotional connections with wood are deep and long: trees, shelter, habitat, even food. The CHG collection of objects made from wood include fanciful and decorative pieces representing various eras and cultures. Step into the fertile imagination of Aaron Weissblum, sculptor, furniture designer, builder, and game designer from Alna, Maine, or stare into the penetrating blue glass eyes of a Cacheton mask from Mexico. The carved saints, or 'Santos,' from Guatemala bring good luck to the home. Imagine a grandfather carving a rocking pig for a beloved child or the majestic Foo Lions welcoming guests into your home. The simple but engaging Bamileke mask, hand-carved in Cameroon - is that a friendly grin or a fearsome snarl?